The voice is produced by the interaction between the sound produced by the vibrating vocal folds and the acoustic resonance of the vocal tract. 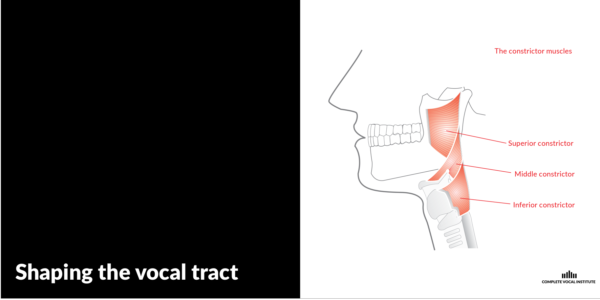 Shaping the vocal tract by moving the lips, changing the position of the tongue in the mouth and oropharynx, and moving the larynx up and down alters the vowel sounds and allows consonant sounds to be made for speech and singing. 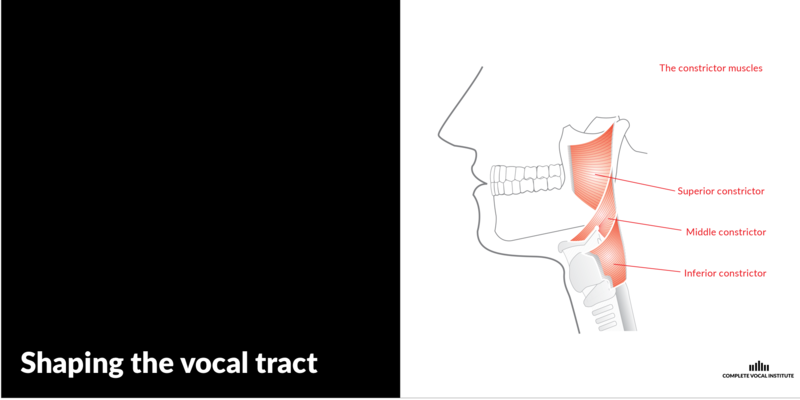 Lowering the larynx generally produces a darker sound colour while raising it causes a lighter sound colour. There are named constrictor muscles (superior, middle and inferior constrictor muscles) but there are many other ‘constrictor muscles’ in the neck, such as the extrinsic laryngeal muscles, which also help in the constriction and laryngeal positioning because of their attachment to the jawbone, base of the skull, sternum and collar bone. The intrinsic laryngeal muscles are the muscles within the larynx that open and close the vocal cords and alter the shape of the vocal folds so that the pitch, loudness and vocal mode can be changed.